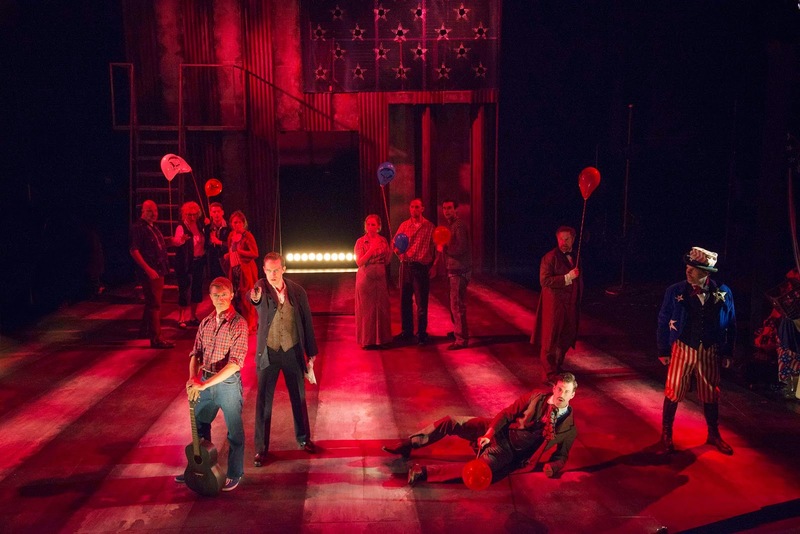 New Rep’s current production, second in their series of three musicals in a row, is “Assassins”, an extraordinarily complex show that, in the right hands, can be extremely powerful. And so it is in this production, featuring an ensemble of brilliant singers who are definitely up to this very challenging score. Unquestionably the most controversial work by the renowned Composer/Lyricist Stephen Sondheim (with Book by John Weidman), it’s a brief historical pageant of sorts with fewer than a dozen songs dealing with presidential assassinations, successful and attempted, throughout the last couple of centuries, from Lincoln to Kennedy. As such it’s unusual fodder for the stuff of musicals. It’s a challenging piece of guerilla theater, afflicting the comfortable without comforting the afflicted, in its relentlessly brazen depiction of the havoc wreaked by misfits looking for fame, love, hate, revenge, or whatever elusive motivation that drives them to death and destruction. Audiences at its premiere at Playwright’s Horizons in New York in 1991 hadn’t a clue what sort of event they were about to witness. No one expected a light musical comedy from Sondheim and Weidman, but what they got was a theme that was a lot darker, more dangerous and disturbing than they expected: anyone can grow up to be President; anyone can grow up to be a killer. As the librettist Weidman put it, “Assassins” suggests that “while these individuals are, to say the least, peculiar, taken as a group they are peculiarly American…they share a common purpose: a desperate desire to reconcile the intolerable feelings of impotence with an inflamed and malignant sense of entitlement.” He went on to say that the reason for the frequency of these attempts (thirteen times in our young history) is because one of our country’s myths is that American dreams “not only can come true, but should come true, and that if they don’t someone or something is to blame”. When each one of Sondheim’s songs commands the stage, this production ascends the heights of musical theater at its best. When the music occasionally stops, however, so does the momentum, partly due to Weidman’s overwritten more comic moments, partly due to the uneven pacing and unsubtle delivery of these moments under the direction of Artistic Director Jim Petosa. Overall, the excellence of the singing, not just hitting the notes but doing so with intensity, makes for a most memorable performance. Sondheim requires them to deliver ballads, ragtime, a cakewalk and even a spiritual, all the while remaining firmly in character; amazingly, they do, with not a single missed nuance. The play begins in a carnival shooting gallery, a prologue that not only introduces the characters we will encounter but also sets the tone of the piece as well as its related themes. It’s a shocking beginning, wherein the Proprietor (Benjamin Evett) urges an assorted bunch of people, most of whom turn out to be certifiable lunatics, to solve their problems by shooting a President (“Everybody’s Got the Right”). A Balladeer (Evan Gambardella, carrying a guitar which he never plays, and makes for an unwieldy prop, a strange choice for this role) enters to tell the story of John Wilkes Booth (Mark Linehan), in hiding after killing Lincoln (“The Ballad of Booth”). Then five witnesses each claim they intervened in the attempted assassination of FDR by Giuseppe Zangara (Harrison Bryan), who had been complaining of stomach pains (“How I Saved Roosevelt”) and ended up shooting Chicago Mayor Anton Cermak. There follows the shooting of McKinley by Leon Czolgosz (Kevin Patrick Martin), inflamed by the rhetoric of anarchist Emma Goldman (Casey Tucker), at the Pan American Exposition in Buffalo (“Gun Song: The Ballad of Czolgosz”), with McKinley dying a week later. Next comes perhaps the most bizarre number in the show, ironically the most melodic song in the show, a duet by Lynette “Squeaky” Fromme (McCaela Donovan) and John Hinckley, Jr. (Patrick Varner) in which each sings of her and his infatuation with Charles Manson and Jody Foster respectively (“Unworthy of Your Love”). Fromme also meets up with Sarah Jane Moore (Paula Langton) to contemplate killing Gerald Ford. Next up is Charles Guiteau (Brad Daniel Peloquin), who shot Garfield after he refused to make him Ambassador to France (“The Ballad of Guiteau”). Then the group, led by Samuel Byck (Peter S. Adams) who had planned to fly into the Nixon White House, sings “Another National Anthem” about how they haven‘t solved either their own issues or the country’s problems, but must follow the American Dream to win their prizes at the shooting gallery. In one of many time-warped scenes, Booth encourages Lee Harvey Oswald (also played by Gambardella) to shoot JFK (“November 22, 1963”) from the Texas Book Depository, which he does, a chilling moment given the relatively benign role this actor had been playing up this point. The ensemble (including Jesse Garlick) then sings "Something Just Broke". In the Finale (a reprise of “Everybody‘s Got the Right”), they all (for the first time including Oswald) reload and get ready to shoot again, but this time it’s not a President they’re aiming at. It’s essentially a revue, but an atypically coherent and focused one, belying this critic’s usual dismissal of the form as not being true theater. Every member of the cast gets a chance to excel, with standouts including the excellent Evett and the imposing Linehan. The technical credits are all superb, from the Musical Direction by Matthew Stern, the terrific Scenic Design by Kamilla Kurmanbekova assisted by JiYoung Han (dominated by a stylized American flag with 32 bullet holes in its stars, and discarded debris from political rallies at both sides of the stage), the Costume Design by Chelsea Kerl, the Lighting Design by Jedidiah Roe, to the Sound Design by Michael Policare. The near-perfect sound balance deserves special mention, as the eight piece band is at the edge of the stage, eliminating the tinny sound that often results when the musicians are hidden and seem to be in some other county. This is a triumph of technical and performing synergy. One wishes that the direction had respected the material more, rather than punching a lot of the funnier lines. Some dispute the appropriateness of the subject for musical theater, yet other tragedies have been successfully musicalized, at least after enough time has elapsed to view them from a distance. Consider, for example, the sinking of the Titanic, fodder for at least three musicals in the past: “Unsinkable Molly Brown” (a comedy yet! ), “Hello Again”, and, of course, “Titanic”. The assassins and would-be assassins of this current piece deserve analysis, as some of them tragically altered the course of history, obviously disregarding the old adage that one’s freedom to use her or his elbow ends at another person’s ribcage. Time is not the only thing that’s warped in this work. Sondheim claimed “some were less than crazy, and some were more then crazy”; Weidman stated that the most disturbing discovery they made was “the lives they lived up to that point and what those lives reveal”. Despite its relentless evil, the play, for a discerning viewer, affords considerable interest, primarily due to Sondheim’s terrific pastiches of period musical styles, and the lens held up to what makes these wounded wackos tick. If one can put aside the insanity of the various protagonists, it’s a fascinating view into the psyches of those people on the periphery of normal life who may well be in part a product of our American political culture. It conveys one of the possible logical outcomes of demonizing an opponent as so often happens in our own day, especially in politics. For the most part, where “Assassins” is concerned, musical comedy it’s definitely not; it’s that rare entry for the non-operatic stage: musical tragedy. It doesn’t attempt to present any choice of persons to feel for, except, as an audience member at the original production of the show put it: “Us. You’re supposed to feel for us”.